If you’re in the East and not used to sunny weather year round, I don’t have to remind you that it is Spring time once again. I am sure you’ve already snatched the shorts, flip flops and sun glasses from their resting places already. Dear old winter has finally made its exit. Spring happens every year, and around this time we usually give more of our attention to freshness, as the warm weather supports many more produce choices for the season. But this season it may be a little different. Restaurant and Home Cooks alike are increasingly supporting local farmers and in many cases growing their own food. The ‘getting closer to your food’ movement is evident everywhere. Food Advocate Michael Pollan has for a long time recommended growing general produce like tomatoes and peppers in you own backyard. He was on Oprah the other day speaking of how having your kids help in planting their own fruits and vegetables improves their relationship with their food and increases the likelihood that they would actually get to love these foods. 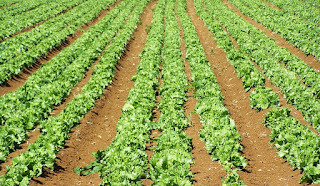 Right now yourbackyardfarmer.com featured in Springwise Business Ideas website, offers a service to get you started with your own garden if like most of us you don’t happen to have a green thump. However, a simple trip to your plant nursery is all you need to begin exploring this home garden option and to get a little inspiration. At least it’s a start. And if like me you don’t happen to have a backyard, then a good idea is to take part in a community garden project in your area. It may be an experience which transforms and greatly improves your relationship to food and nature in general. You can get all the latest updates to my blog for your ipod or other mp3 player. Check out the link to find my feeds.